A Lake Garda spa....perfect for those who feel stressed, are carrying an injury, or just want to really relax and be pampered. No matter where you are staying you are bound to be not too far away from a good spa. Lake Garda is, of course, famous for its thermal spas which drew the Romans in great numbers to Sirmione. Many swear by its healing powers, so it's definitely worth checking out. 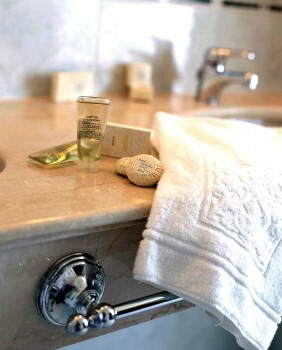 This spa is situated in the historical center of Sirmione overlooking lake Garda. It offers a large variety of spa treatments and relaxation services including various types of massages and therapies, facial and body treatments, and underwater therapy. There is a lovely thermal swimming pool to relax and unwind in that has a great view of the lake. The sulfurous water that this Lake Garda spa is sourced by is excellent for muscular and sinus problems. This rises from beneath the lake at a temperature of 69C (156F). The Boffenigo Boutique hotel and spa, at Garda. Centro Benessere Termale Aquaria, Sirmione. This is a wellness center that overlooks Lake Garda and is a charming place for your physical and psychological well-being. It offers four choices of pampering: Wellness, fitness, beauty or health. You can stay one, two, six or twelve days there, and enjoy some relaxation with the well-being services and the lovely thermalbath. This is located south of Sirmione, in Colombare which is at the foot of the peninsula of Sirmione. It was built in 1987 and has the most modern equipment for the thermal cures. It offers various types of massages and therapies, underwater excercises and cures for vascular and dermatological affections. This is a very nice Lake Garda spa and wellness hotel. Its premesis includes a Spa, beauty center and thermal center. Everything your body and soul desires, from massages to turkish baths, is all in one hotel, so you can unwind and be pampered to your heart's content! It also boasts several indoor and outdoor thermal pools for its guests' use. Parco Termale del Garda, Lazise. This is not an ordinary Lake Garda spa, it is a delightful natural setting where you can relax and enjoy the surroundings of nature at the same time. This park consists of a large lake, fed by thermal waters of 37C. All along the edges of the lake, there are waterfalls and jets of hot water. It is lit up beautifully at night too, so you can enjoy it anytime! There is a charming villa (Villa dei Cedri) and several residences in the park, and Beauty treatments for women are also offered. Note: From 9am to 10am it's open only for therapeutic bathing; A medical certificate is required. From 10am it's open to everybody. Ninfea Wellness center (Park Hotel Faver), Tremosine. This wellness hotel is 550 meters up in a quiet area and enjoys a pleasant mountain climate as well as a breathtaking view of Lake Garda. It has indoor and outdoor swimming pools and offers massages, sauna, turkish baths, steam baths, mud baths and more! They also offer various Beauty packages and Wellness Packages. 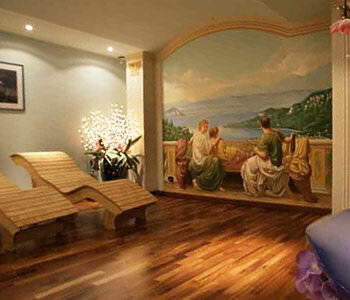 Wellness & Beauty Centre (Hotel Regina Adelaide), Garda. This hotel faces the lakeside promenade. Its wellness centre offers beauty treatments, massages, swimming and acquagym courses. There are also two swimming-pools with jacuzzis (one indoor and one outdoor), sauna and Turkish-bath. They specialise in using the exclusive 'Piroche' method in their selection of spa treatments. To view details online of hotels which have spas or beauty centres, simply click on the link below the 3 pictures above, (no link by top picture).